This design incorporated these architectural elements. Judging from the plaster walls and original hardwood floors, this is an older home that has been very nicely renovated while still retaining its character and custom features not widely seen in today's homes. 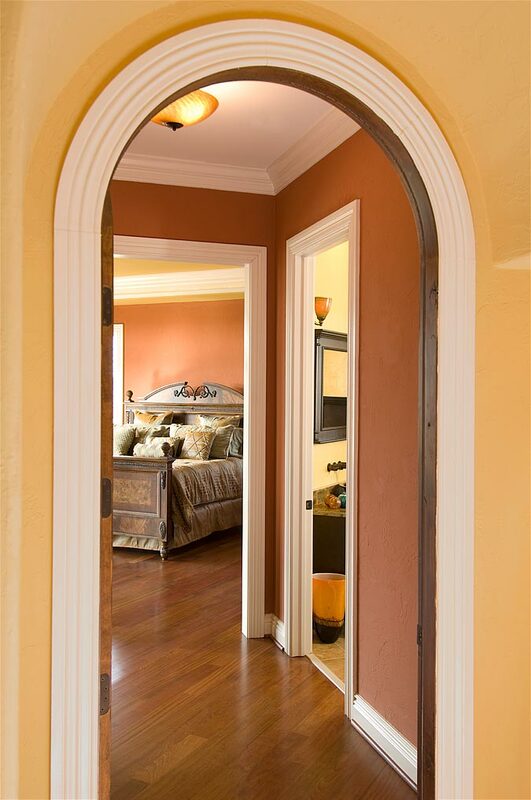 The arched romanesque doorway makes a charming entrance to the master bedroom area. The baseboard and moldings used in the hallway and adjoining rooms stand out brightly against the terra cotta painted walls. It appears that the crown molding in the bedroom was used within the soffit area of the ceiling, which when combined with the 2 different wall colors gives a layered, unique look. A crown molding similar to the CM-1027 was used on the soffit area of the ceiling in the master bedroom, which beautifully enhances this feature. 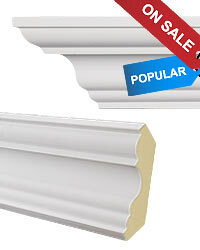 Door trim similar to the ET-8720 and ET8743 was used to frame the doorways leading to the bathroom and master bedroom. 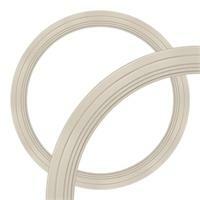 An arched molding piece similar to the ER8743-100 was used within the barrel vaulted doorway leading to the master bedroom wing, which nicely accents this area.